The biggest, most immediately noticeable change beyond updated graphics and sound (which includes a charming voiceover for Mickey during gameplay) is the addition of a hub world. 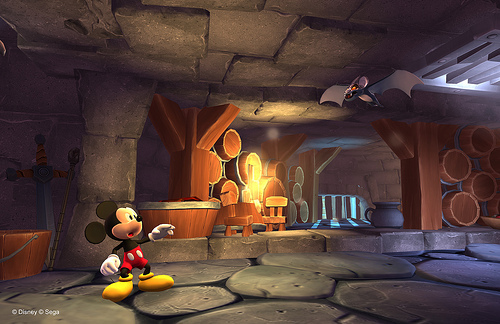 In the original game, Mickey wandered the Castle of Illusion to introduce each new level. Here, the castle is envisioned along the lines of Super Mario 64, as a three-dimensional hub world by which all of the levels are accessed. It’s a fun change that makes the castle feel like an actual place, instead of merely a setpiece for the plot. 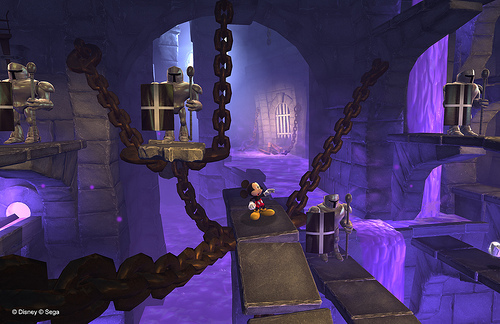 It’s a fantastic mix of elements that are clearly from an older era — watching as I played, Nick pointed to the knights in the background attacking as Mickey runs past as one of these elements — with more modern platforming fixtures, such as multiple changes of direction (moving both from left to right and vice versa) and horizontal progression combined with vertical platforming. Anyone who is old enough to have played through the original Sega Genesis version of the game knows that it’s not easy — like many platforming games of the 1990s, much of the fun in the original Castle Of Illusion comes from its challenge. Sega Studios Australia kept this in mind throughout development: “Our target audience is the retro gamer, our age group that played the original back in the day. It’s not a kid’s game,” said Woodley. Faithful to the original game, Castle of Illusion still has an emphasis on dodging over combat, and ammo for ranged attacks remains quite limited. For reference, despite being able to beat Super Metroid or Castlevania: Symphony of the Night in under an hour, I died repeatedly during the demo. Sega Studios Australia has nailed that feeling of “tough, but fair” that kept people playing the best games of the Sega Genesis era over and over again. Woodley explained that the updated look of the game was heavily inspired by Disney movies and television shows, and it’s easy to see. The color palette in the dungeon level we played appears to be lifted right out of Fantasia: everything looks vibrant, even in the relatively dark dungeon level, as if we were playing through a Disney film. Mickey himself is an extremely animated character, and the Sega Studios Australia team was quite proud of the way he is always active, even during a variety of idle animations. Woodley shared that the original Castle of Illusion was the first game to feature multiple idle animations, so the team is paying tribute not just to Mickey’s cinematic heritage, but his long history with video games as well. Our final question to him was regarding the potential for completely new levels in the game, and Woodley politely declined to comment. Given all of the encouragement the team has received to take creative liberties with the original material (including from the original Castle of Illusion designer, who now works for Disney instead of Sega), it’d be shocking if the team didn’t have a couple surprises still hidden up its sleeve for when the game, which is shaping up to be one of the most ambitious releases of an older title to date, releases in a few months. Hopefully Sega Studios Australia raises the bar for future introductions of older titles to modern gaming.